My Greater Victoria Real Estate Market Update for the Fall is now available! As we enter Fall, Greater Victoria is seeing a consistently active real estate market, but we are very slowly inching towards more balanced conditions. A total of 640 properties sold in the Victoria Real Estate Board region this September, 18.1% fewer than the 781 properties sold in September last year. The ten year average for sales in September is 573 properties and the month still exceeded that average by more than 10%. Recently we’ve seen overall price increases level out, which can indicate slightly less demand, and inventory is building. After a small decrease and a consistent number of active listings over the Summer, there were 1,976 active listings for sale on the Victoria Real Estate Board MLS® at the end of September 2017, an increase of 3.1% compared to the month of August and 4.1% fewer than the 2,061 active listings for sale at the end of September 2016. 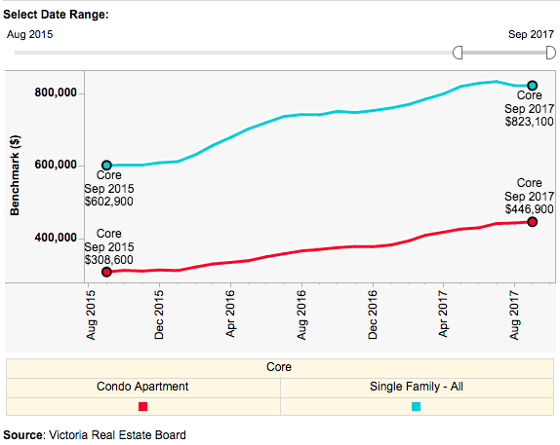 August was the first month we've noted a decrease in HPI values since August 2015, the August HPI benchmark value for single family homes in the Victoria Core area decreased by 1.3% when compared to July, however other product such as condominiums in the Victoria Core has seen HPI values continuing to increase. We have also seen a strong focus on the lower priced end of the market, with condos, townhomes and single family homes listed for under $700,000 in high demand. Many of those properties saw multiple offer situations. The Bank of Canada raised their interest rates for the second time in just a couple months by another 0.25% to 1%, the banks have now raised their prime lending rates to 3.20%. We could be seeing another increase this Fall, if you are thinking of buying and get a pre-approval the rates available for you at that time will be held for 90 days as you search for your new home. Last October the Canadian Government introduced "stress testing" to high ratio mortgages, less than a 20% down payment, meaning you are qualified for a mortgage at the Bank of Canada posted rate and the purchase price you qualify for is about 20% less than at our current interest rate. This may be introduced to conventional mortgages, more than a 20% down payment, in the new year, if you have any questions about how this could affect you feel free to contact me at mikaila@mikailarhodes.com or 778-679-1028. There is an exciting new development coming to the market this Fall for home buyers that are looking to purchase in a new building Downtown. Chard Developments has announced their new building Vivid on the 800 block of Johnson St. will be priced at 8% under market value! There will be qualifications to purchase in the building such as an income of less than $150,000 and living in the home for two years after move in, they anticipate prices will be in the range of $275,000-$550,000. This is a great opportunity for first time home buyers to purchase in a quality development at a great price point!